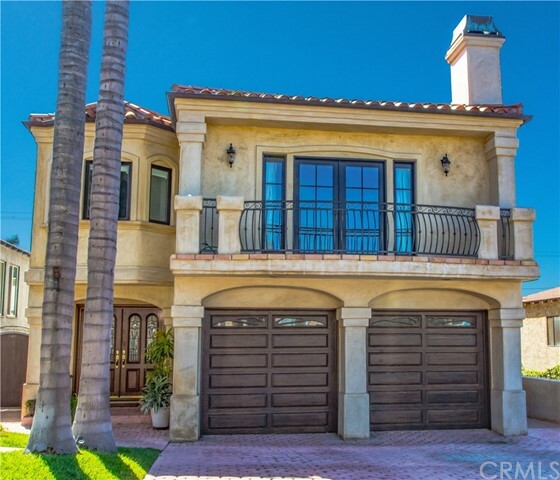 Introducing an extraordinary custom home on the Avenues just blocks from the beach in South Redondo and Riviera Village. Built in 1991 it went through an extensive $1 Million dollar remodel with no expense spared in design. This exceptionally designed, beautiful beach home is perfect for those who love to entertain and relax Upper and lower level living areas, 3 dynamic fireplaces, custom media room, this home is fully wired with Crestron integrated audio system. It has a true gourmet kitchen designed by a Cordon Bleu chef with custom granite counters,48” wide refrigerator, Wolf 48”dual fuel range, Wolf under counter warming drawers, SubZero 2 drawer under counter refrigerator, microwave, 2 Dish washers, wine cooler and in cabinet Miele coffee espresso machine for the home barista. Palos Verdes and ocean coastline views from living areas and a rare spacious rooftop deck with 180 degree ocean views ensure will never miss a sunset. Custom cabinetry, Granite, Onyx, Carrera Marble counters, chiseled edge marble floors, and custom oversize plank walnut hardwood floors throughout. Master suite has its own private fireplace, spacious spa shower with Mister Steam Unit, Bain Ultra air tub, travertine floor, Suite also has a large walk though custom closet. An added bonus is a spacious laundry room with double washer and steam dryer units so your clothes will be cleaned in half the time. This home also has a 2nd master suite and massive backyard that has enough room for a pool.